Dawn Doutrich earned a Bachelor of Science in nursing from Washington State University, and a Master of Science and PhD in nursing from Oregon Health and Sciences University. She completed data collection for her dissertation in Japan and returned to Japan on a Postdoctoral fellowship in cross cultural nursing ethics at Nagano College of Nursing, supported by the Japan Society for the Promotion of Science. She been in leadership positions at Linfield School of Nursing and Washington State College of Nursing where she is an Associate Professor and Associate Director on the Vancouver Campus. Her clinical practice includes mental health nursing, particularly with refugee survivors of torture and trauma and she was a clinical nurse specialist (CNS) in public health nursing. Dr. Doutrich serves on the Clark County Public Health Ethics Advisory Board. Her research has included academic-practice collaborations with public health. She served on the Board of Directors for the Society for Clinical Nurse Specialist Educators (SCNSE) and has been a peer reviewer for HRSA, Nursing and Health Science and Journal of Nursing Education and many other journals. 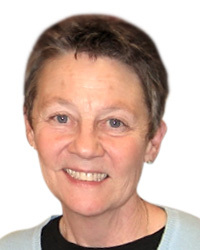 Dr. Doutrich has taught in the community area and has a special interest in nursing education. She was successful in attaining HRSA funding to support the Nurse Faculty Loan Program for WSU nurse educator graduates. Her research interests have focused upon cultural competence/cultural safety in health care, nursing workforce diversity, and cross cultural ethics. Recent research includes: cultural safety in New Zealand and the U.S.; international nurse educators: what the experts say; and creating a diverse nursing workforce through workforce partnerships.